Tune in to Field Trip, this Sunday, July 16, from 11:00 PM-12:30 AM for a special program of rehearsal recordings and interviews with Yousef Shamoun & the Tarab Ensemble. 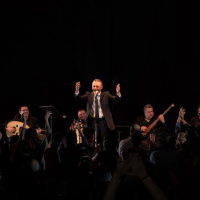 Hear behind-the-stage tracks from the dynamic Tarab Ensemble, and conversations with members of the group, including brother Saphe Shamoun and violinst Yaser Abustaif about the importance of preserving and sharing cultural Syrian music. Historic Syrian compositions, as well as those by Ziad Rahbani, and the Egyptian composer Abd al-Wahhab are featured. This is an excellent chance to preview the Ensemble's upcoming show at Le Poisson Rouge on Friday, July 21.